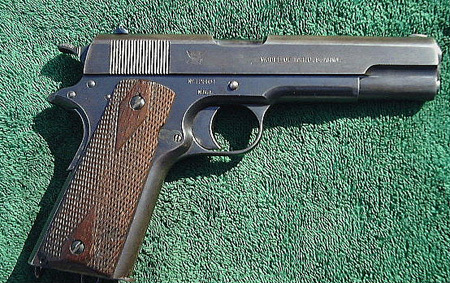 This is an example of the Colt M1911 manufactured and sold to a member of the National Rifle Association prior to World War I. The guns were sold to NRA members for $16 each. “N.R.A.” is stamped just below the serial number on the right side of the frame (just above the trigger). Guns made by Colt and Springfield Armory were both sold to the NRA in this program. Approximately 100 were sold and are quite desirable now.